We all know that struggle when we look at our bank accounts, contemplate a purchase, and then do it anyway. We can't help it, we're only human! But we all know that look of disapproval, and no one does it better than actor Terry Crews! Los Angeles resident Darrel Kennedy thought if she saw Crews - who played a very frugal father on Everybody Hates Chris - on her debit card, it would help her spend less. So, she put a request into Wells Fargo. Kennedy said the design started off as a joke between friends. She said she expected the bank to approve the card and send it her way. "The compulsion to save money was just the icing on the cake since I know my stress shopping may need a little bit more than the picture on my credit card to make me evaluate what I'm about to buy," said Kennedy. However, she claims Wells Fargo rejected her claim, saying she needed Crews' approval. So, she quickly took to Twitter, begging for retweets. "They rejected my request because they said i needed written approval from @terrycrews Can y'all RT or tag him so a girl can save some." And she was in luck! Crews saw the requested and tweeted back, "I approve. Signed, Terry Crews." "Y'all I'm dead, Wells Fargo about to be so shook," she replied. But that wasn't all, not only had the bank approved Kennedy's request, they also expedited the order. Kennedy said she still hasn't received the card yet and feels that Wells Fargo is making the process harder than it has to be. "Wells Fargo has been really slacking on verifying and approving the image so that I can resubmit it," she said. "I've had to call them to remind them of this twice now, and I plan to call again today. I still have hope that I will receive the card before the New Year." Maybe Crews will have to step in and get the ball rolling! But Kennedy said she's just glad Crews is playing along. "I'm so glad and honored that he approved the image," she said. "It's proof that he has a great spirit and even better sense of humor. 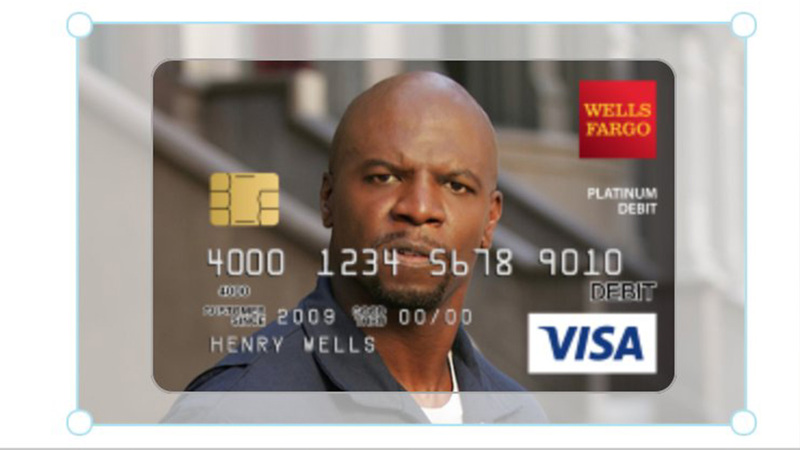 I'm even more honored to be the only person, outside of Terry Crews himself, to be able to get this coveted credit card."